Despite their reputation for being meddlesome, disease-carrying scavengers, raccoons are actually highly intelligent, playful creatures that can make great pets if cared for properly. These nocturnal, opportunistic creatures have adapted extremely well to life in suburbia, feeding on the garbage of households across America. In captivity, raccoons will eat everything from table scraps to high-protein cat food. Pet raccoons will eat just about anything, but it’s important to provide them with a balanced diet to avoid obesity and other health problems. If you are planning to keep a raccoon as a pet, it's OK to feed him chopped up, prepared food like you would a cat or dog. But if you plan to release him into the wild at some poknt, you’ll want to present his food as naturally as possible. This way, your raccoon will develop the scavenging and hunting techniques he’ll need to survive. Provide your raccoon with a constant supply of water in a small dish or trough. Always keep water in the same place so your raccoon will know where to find it. Raccoons love to wash their food before eating it, so make sure there is water present whenever he eats. Feed your raccoon a diverse, balanced diet rich in protein. In general you want to avoid simple carbohydrates and focus on hearty foods like eggs, vegetables, fruits, nuts, chicken, fish and turkey. You can feed him table scraps as long as it’s relatively healthy. It’s also perfectly fine to give your raccoon a treat occasionally to reinforce good behavior, though raccoons tend to be a bit more unruly than standard domestic animals. Baby raccoons require very different care. Separated from their mothers, baby raccoons are entirely defenseless and susceptible to dehydration. Feed baby raccoons puppy replacement powder in an equal mixture of sterilized water and goat’s milk. Never feed a baby raccoon cow’s milk. Babies should be fed multiple times a day. Consult a vet for additional vitamins to help keep the baby strong and healthy. Feeding raccoons outside your home can be a fun way to build a relationship with these charming animals and observe them socializing. 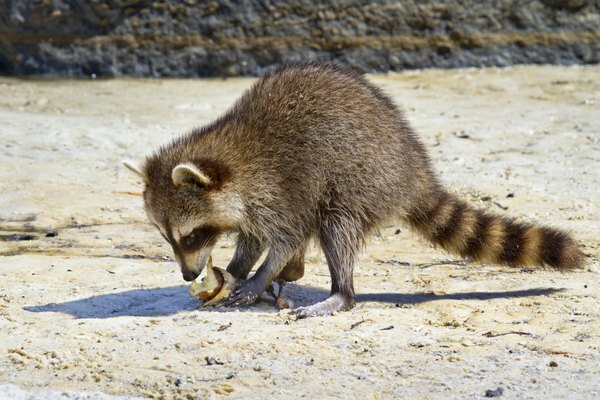 There’s no right or wrong way to feed wild raccoons, though there are some guidelines you should follow to avoid harming the animals and yourself. Provide your raccoons with plenty of healthy food that is rich in protein. This could include a mix of nuts, fruit, peanut butter, fish, turkey and chicken. Raccoons love dog and cat food, too. If you’re feeding a large group of raccoons, place several different plates of food so they don’t fight each other over dibs. Raccoons are generally peaceful animals, but they will get vicious if there’s a scarcity of food. Don’t feed wild raccoons by hand. 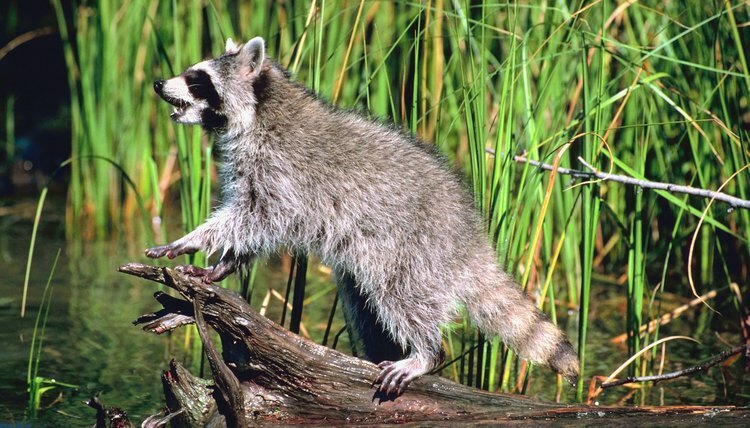 They are cute and cuddly-looking, but raccoons have sharp claws and teeth. They also carry rabies, a potentially deadly disease. 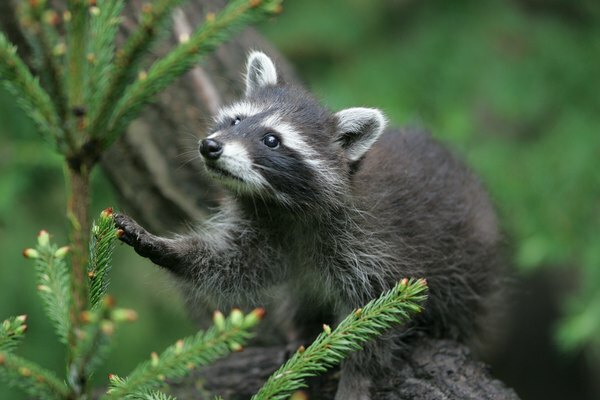 If a raccoon bites you, it will be taken away by the authorities and killed. Don’t let the raccoons get too accustomed to free food or they will demand it when you cut them off. Stagger their meals so that they continue to forage and hunt for themselves and only return to your yard every couple of days. This is better for you and for the animals in the long run. Raccoon Babies - What To Do?